Cafe St Honore, it’s been on the bucket list for a long time so was delighted to have an excuse to visit this week with a few friends. Chef Neil Forbes has established himself as one of the countries top chefs, known from local produce and sustainability. From Slow Food to the Sustainability Restaurant Association he has been a vocal advocate of all that’s good about Scottish food right now. The setting feels like a village bistro is the Loire valley, the service is attentive but relaxed and the wine list is balanced from affordable to the slightly more extravagant. The Cafe have a Classics menu which changes on a seasonal basis and it’s has to be said it really is a delight. At £18 for two courses or 3 courses for £23.50 available all night it’s also a bargain. For my starter I opted for the hot smoked mackerel salad. 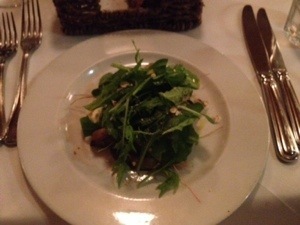 I am a fan of all things smoked it has to be said but this salad was so light and the fish was delicious. The balance of the flavours with the peppery rocket was well…..nom!! Not the most eloquent word but you get it. For main I went for a superb dish of plaice, one of my favourite fishes to find it on a menu for this price was a lovely surprise. 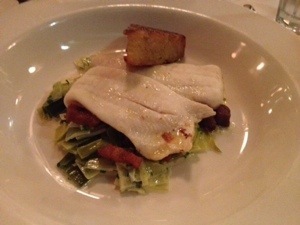 Served on creamed leeks with a potato rosti and bacon the balance was as you would expect from this chef just right!! 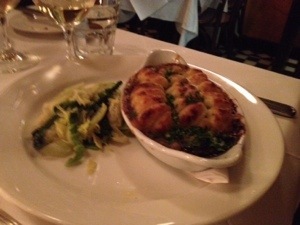 The other main on the menu which I tried and loved so felt I had to share was a venison cottage pie. 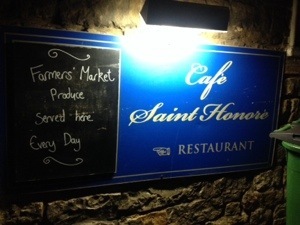 Tradition with innovation and local produce…..for me that sums up this place. I am for sure going to come back and try the a la carte but for now I will just reminisce and enjoy the memory of my lovely meal. In the end Cafe St Honore come Highly JD Recommended!